A person who enjoys interacting with the public and wants to run their own business has a dream of opening a small hotel. And as there are many attractive tourist destinations across the country, it would be great to start a hotel business in Bangladesh. But, it’s not as easy as you’re thinking. This is because you can’t just open your doors and expect your hotel to be successful automatically. It not only takes a careful research and management but needs financial planning to make a hotel a success. That’s why you should keep these all in your mind while planning to open your own hotel. Moreover, we’re going to provide you an in-depth hotel business guide regarding how to start the business. This is made with well research and analysis so that you can get success following this guide. As Bangladesh is a good place to tour, the hotel business in Bangladesh is optimistic. Not only the largest sea beach in the world (Cox’s Bazaar) but the place of the sun rising and the sun setting place in the same location (Kuakata) is situated in the country. These all made it one of the top traveler destinations of the world. When travelers come to visit these places, they need to stay in a safe and secure place. And the place is a suitable hotel definitely, right? So, you might understand the necessity of a hotel in the country. Besides, a lot of native travelers visit different parts of the country and they also need to stay in a hotel, or guest house. Here is your business scope in the hotel industry if you’re thinking to invest a large amount of money. As this is not far-fetched, the hospitality business in Bangladesh is seen as a very serious trade. Also, because of its relationship with the tourism industry, the hotel business is taken seriously. One of the ways to make people who arrive at unknown places at ease is by having a very relaxed hotel in place for them to lodge in either locally or internationally. It’s another reason for booming the hotel business continuation. And it’s one of the best businesses for an entrepreneur to start a hotel business. It’s not only for the lucrative nature of the business but the prosperity involved in this industry. Well, let’s know how to start a hotel business in Bangladesh with some simple steps. 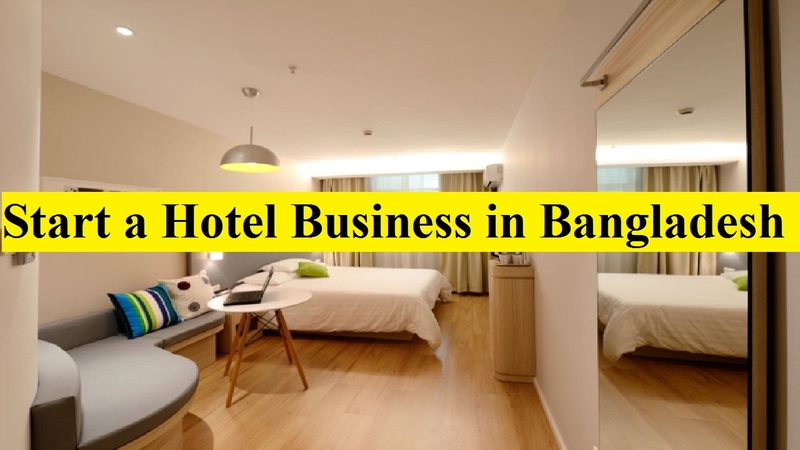 You’ll probably need to get start-up capital from either a bank or private investors when starting a hotel business in Bangladesh. You’ll have to think more broadly and decide what city or town you want your hotel in before worrying about exact locations. And you’ll have to consider what the tourism industry in a given area is like at the minimum. You’re probably catering to vacationers and sightseers instead of employees on business trips since this is a small hotel or guest house and not a chain. You have to know how you can successfully carve out a market for yourself when you good feel for the competitors. So, when you investigate potential competition, there are a number of things you should look for. And if you want to get an idea of how you can make your hotel stand out, you’ll get it from this. Also, try to know what your competitors charge by looking at all the local hotels of their nightly rates. But, keep in mind that you shouldn’t try to drop prices to compete with it when a hotel is cheap but all the reviews are terrible. In this case, the price isn’t everything because the visitors’ remarks are worth more. And they make good remarks when they find things in the actual state. Another one of the most essential steps is to market your hotel business so that people can know what you’re doing. It’s basically invisible to your potential customers if your hotel isn’t on the internet. As the days are the internet, all people search for hotels through the internet. So, you can’t help getting an online presence via a website. Although it may be worth the investment to have a professional work on your site, you can design your own website. However, your site should have hotel’s name, location, contact information, and nightly rates at the minimum. As there is more personal touch, small hotels often attract guests. Also, keep in mind that it should be accurate and up to date whatever you put on your site. Before launching a hotel business in Bangladesh, you need some necessary documentation in place. That’s why without the proper documentation you can’t successfully run any business in Bangladesh.